In 1986, the Capuchin Order, which advertised for contributions to build a chapel and mausoleum to honor the victims, completed construction of a small church on the site of the camp. At the entrance to the church stands a life size wooden carving portraying Father Maximilian Kolbe, a Franciscan priest who had died in Auschwitz and was later canonized, behind barbed wires and crematorium chimneys of a Nazi extermination camp. This carving conveyed the unfortunate and erroneous impression that non- Jews, particularly Catholics, were victims of Sobibor. In fact, the only Christians killed in Sobibor were the 10 SS men and about a dozen Ukrainian guards killed by the inmates on the day of the revolt and escape. In addition, a kindergarten was built on the site and a portion of the camp was converted into a playground, complete with slides, carousels and swings, on the exact spot where thousand of Jews had been tortured and killed. Not only had life been taken from the Jews at Sobibor, but the memory of their very existence was being erased. 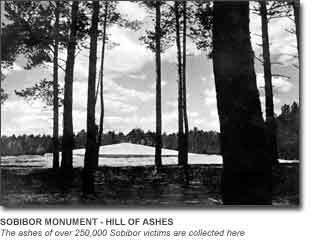 In 1987, I became chairman of the Holocaust Sites Preservations Committee, with the goal of preserving not only the site but also the historical integrity of Sobibor. A broad spectrum of Christians and Jews, business leaders, politicians and academia the world over supported these efforts. Seven years later, as a result of intensive negotiations with the Polish government, a new topographical map was officially accepted for Sobibor, designating it as a historical landmark. The kindergarten was closed and the building is now a Sobibor museum. The most difficult task proved to be correcting the false text of the commemoration plaque. The negotiation continued over three governments administrations. After producing court documents, testimonies of both victims and perpetrators, including SS Frenzel's testimony from my interview with him, an agreement was reached that the plaque should state the truth: that 250,000 Jews were the victims of Sobibor and that the phrase "and about 1,000 Poles" (i.e. Christians) should be added to the plaque. Now, In the place of the original false plaque, five new, historically accurate plaques were installed by the Holocaust Sites Preservations Committee, founded by the Milken Foundation, the Dutch and German governments. The plaques state clearly and unequivocally in five languages that the victims of Sobibor were Jews. On the 50th anniversary of the revolt, the Holocaust Sites Preservations Committee and local authorities sponsored a commemoration ceremony at Sobibor. Members of the government attended, and letters from President Walesa and Prime Minister Suchocka were presented. Speakers included Marek Edelman, second in command in the Warsaw ghetto revolt, representatives of the government, military commanders, a rabbi and a Catholic bishop.